We’d love your help. 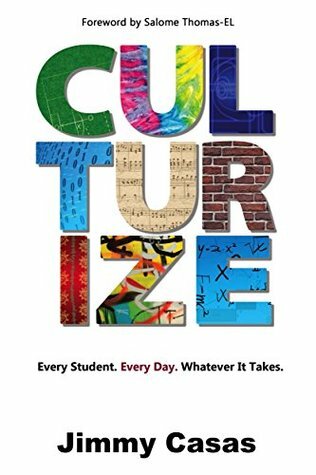 Let us know what’s wrong with this preview of Culturize by Jimmy Casas. Average schools don’t inspire greatness—and greatness is what our world needs if we are going to produce world-changing learners. In Culturize, author and education leader Jimmy Casas shares insights into what it takes to cultivate a community of learners who embody the innately human traits our world desperately needs, such as kin Eradicate Average! —Kayla Delzer, CEO, Top Dog Teaching Inc.
To ask other readers questions about Culturize, please sign up. Some great ideas here. Primarily for administrators, but useful to teachers, too. This book has a solid message: remain positive and work hard for every student. I can get behind that. But, the actual experience of reading this book is not entirely motivational. The writing is really lazy in many parts it cannot afford to be. As an English teaching, I was constantly thinking, "Where is your source?" Casas makes a lot of exciting claims, but fails to back them up with research, even though there are numerous writers that he could be citing. For example, Cal Dweck's work on min This book has a solid message: remain positive and work hard for every student. I can get behind that. But, the actual experience of reading this book is not entirely motivational. The writing is really lazy in many parts it cannot afford to be. As an English teaching, I was constantly thinking, "Where is your source?" Casas makes a lot of exciting claims, but fails to back them up with research, even though there are numerous writers that he could be citing. For example, Cal Dweck's work on mindset and Brene Brown's work on vulnerability. He missed so many opportunities to strengthen his arguments! To me, it slashed his credibility and my investment in his message. I really like how this book gave me the strategies I could use tomorrow in my classroom. Jimmy speaks from the heart and that means a lot when you are a teacher who sometimes questions if you are doing a job that is right for you. I have read many professional books however this one will stick with me because it comes straight from the heart. This is a must read for all educators, no matter your role! This book is written woth such voice, that it feels like I'm sitting in the room. Jimmy writes with such passion to affirm the hard work you are doing and to reinspire the work you have yet to do. Culturize is must read book for all educators! Jimmy is a master at describing how cultural is important to a school district. His stories are inspiring and give hope to all educators. mandates are at the opposite ends of the spectrum from what this book presents from the author's many years of experience and what research supports in regards to learning. Felt more of a use for administrators, but I can see this use with colleagues and teammates. I also disagree with Casas’ graphic on p. 102 about being an “awfulizer,” particularly saying that criticism falls into that category, rather than in the “awesomizer” category. Being critical of pedagogy and leadership is getting a bad rap, but without critical feedback, we don’t grow. And criticism can happen in a healthy way, and can definitely be done in ways that aren’t mean or offensive. Great, quick read full of encouragement for teachers and administrators who are looking for some new strategies to boost morale or trying to avoid burn-out. While a bit repetitive at times it drives home the importance of our job as educators and provides practical tips for “culturizing” our schools. Badly organized, filled with tangents and unclear transitions, and no research base. Doesn't add anything new to the discussion of improving culture. If you are a teacher, leader or looking to take a step into the field of education, this is the book for you. Culture is something that is needed in our classrooms and schools and it is up to us to bring this positivity and togetherness. Throughout this book I Appreciated the ideas that Jimmy Casas shared and took notes from every page. I’ve been in the field for 14 years and this book was incredibly eye opening. Read this book as part of an assignment for our leadership team at school. It was okay. There were some good ideas and I agree with motivating students and forming connections, etc. However, it did lend itself a lot more to readers who are in an administrative role. I found it more challenging to get through than I was originally hoping due to the lack of giving concrete ways to implement ideas right now. Jimmy’s passion shines through in this great book about creating amazing school culture. Culture is so vitally important to the success of any organization. Jimmy shares stories, strategies and experiences to help any teacher or administrator create the kind of transformational culture all schools deserve. What a great book! This has filled me with so much excitement! It has great reminders of why we are the profession of teaching and challenged me in many areas of which I need growth! Relationships with students, parents, and colleagues matter! Communication is essential. In short your vibe attracts tour tribe! Every person who serves in schools should read this book! I mean every person (paraprofessionals, secretaries, superintendents, teachers, counselors, cafeteria staff, etc...)! You will be motivated to provide a nurturing, positive, and meaningful school climate for students and colleagues. Do not hesitate...Culturize! I read this book as part of a summer PD offered by my school district. Personally, I really struggled with his writing style. Also, the parts of the book that resonated with me most were ideas my people other than the author. Were there parts that made me think, yes- were there parts that felt repetitive- yes. This book left me inspired me motivated as so many of the #TLAP books have. But it also gave me a sense of calm and time to reflect on my own growth as an educator. A wonderful reminder to embrace the passions and find what makes teaching such a wonderful life. As a new administrator this was a great book that underscores the importance of establishing and maintaining positive relationship s with students, staff, colleagues and the entire school community. I love Jimmy's passion and am inspired by his love for all students. He gives simple, practical ideas that can easily be implemented to create learning environments that serve all students. He is very empathetic and stresses the importance of not giving up ever on any student. This book was just what I needed to read in order to remind myself of why I chose this profession. It's about relationships and being awesomeness vs. awfulizers. We set the tone for every day. Jimmy identifies keys strategies to create a system of success for all stakeholders. He has an eloquent way of writing his stories,as a reader you feel like you are right in the room as he tells them. Great read for educators and leaders. Must read for every teacher, administrator, board member. In the end, to get the results we desire in schools we must change behavior. To change behavior we must change the culture. Excellent. I found some great food for thought: be excellent and positive, dont let people opt out, hold people accountable. It's all about relationships. However, I lost the thrill of the message that was a repeat of what everyone else is saying. So this book has lots of good nuggets. But I didn’t feel it was a cohesive whole. And I struggled with some of the repetitive information. There were a lot of places 8 wished it were less abstract! But my fave parts were the stories! Very inspiring! Pretty good read about building classroom and school culture. Wonderful, inspiring book. Perfect teacher summer reading!